After his Enlightenment, in a show of profound gratitude to the Bodhi tree that sheltered him, the Buddha stood at a distance and gazed at the tree with unblinking eyes for one whole week. 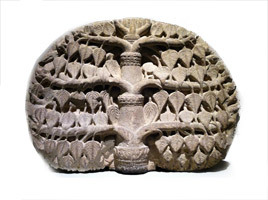 In order for people to pay their respects to him while he was away on preaching tours, the Buddha also sanctioned the planting of a seed from the original Bodhi tree in front of his monastery. In this way, it would be as if he was ever-present. One of the Bodhi trees in KMSPKS is a scion of the sacred Bodhi tree at Anuradhapura in Sri Lanka and is hence a direct descendant of the original Bodhi tree under which the Buddha attained Enlightenment. It is customary for Buddhists to pay respect to the descendants of the original Bodhi tree.